Perth’s most prestigious golf club has signed a Preferred Partner Agreement with Jacobsen’s Perth supplier, McIntosh & Son. 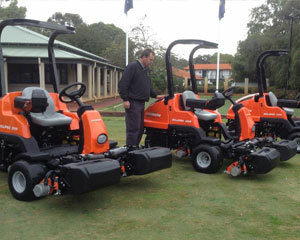 For the next five years Royal Perth Golf Club have committed to exclusively purchase Jacobsen machinery. 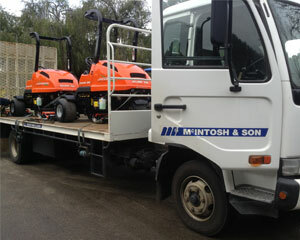 turfmate was first on the scene to witness McIntosh & Son deliver three Jacobsen 322 Eclipse greens mowers at Royal Perth. The Diesel Mower is a premium hybrid machine that has been specifically engineered to maintain the highest quality turf for golf courses around the world. Brad Dawson, the General Manager of the Royal Perth Golf Club believes there were a number of contributing factors as to why the club chose to exclusively purchase Jacobsen machinery from McIntosh & Son. 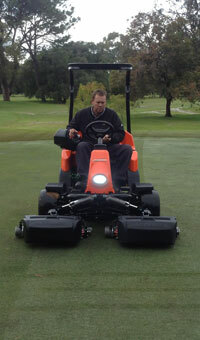 “The mowers and products of Jacobsen themselves are of first-class quality. “The Greens Mowers sell themselves because there are no more hydraulics on them. “The quality of cut was a big reason for this partnership. 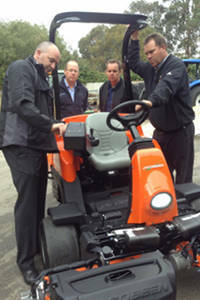 Jacobsen’s Regional Sales Manager of Australia and New Zealand, Mike Foskett, was also on hand for the delivery of the new mowers and is confident that investing in these mowers will prove to be beneficial for both the club and the 10 full-time staff members in the course maintenance department at Royal Perth. Mike Foskett says; “There are a few aspects to consider. to take the 322 Eclipse for a ride. “From an environmental footprint perspective, they’re going to be using less diesel. No oil as well. “From the golf course’ perspective they don’t have to worry about getting rid of oil filters and at the same time they will improve the quality of cut. The 322 Eclipse boasts the usage of 15 blades as standard the height of the cut easily adjustable. There is also an additional brush that Mike has chosen to purchase with spiral bristles that automatically spin to free excess grass build up on the rear roller. Having hosted the 2012 WA Open event, as well as the last four Australian Senior Opens, the course maintenance team at Royal Perth Golf Club ensure they trim the course everyday. The superintendent shows no anxiety over using the latest in mowing technology. “I think they’ll fit in with our maintenance program and easily take the place of our current machines. Michael Foskett says the signing of this agreement is a positive step for the Jacobsen Brand. “The decision was obviously made to go down this path by Royal Perth Golf Club because we already had some Jacobsen machinery, and Mike Dennis was open to the idea of the Jacobsen machinery. With over 1500 members to impress, General Manager Brad Dawson says, “It’s very exciting! We look forward to maintaining a long-term relationship with Jacobsen and using Royal Perth as a showcase-course for Jacobsen machinery. McIntosh & Son Branch Manager Dean O’Reilly is also enthusiastic about the newly formed relationship with the team at Royal Perth Golf Club. “I think it is a very exciting time. Judging by Mike Dennis’ brightly lit face when he trialed the new Jacobsen mowers, it’s obvious that this is the start of a great relationship within Australia’s turf industry.